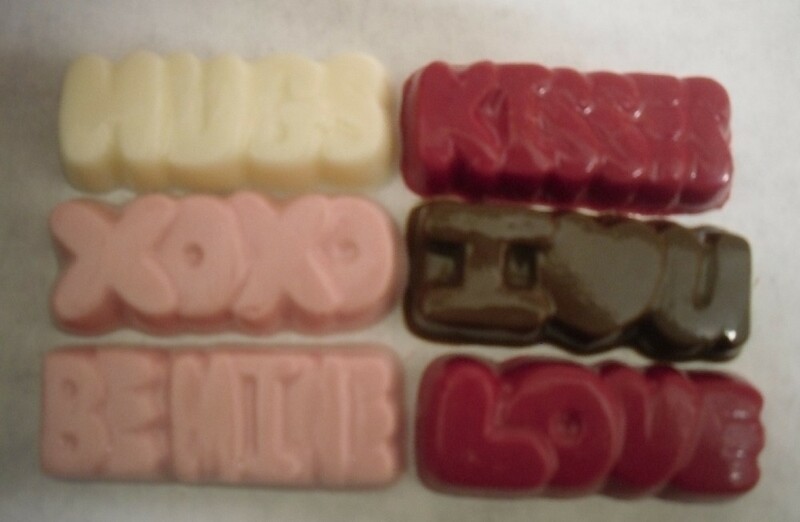 This listing is for 1 set of 6 different mini sayings in chocolate that are the perfect Valentine's Day gift. These would be great for wedding favors as well. The sayings include: Hugs Kisses XOXO I *heart* U Be Mine LOVE They can be made in colors of your choice (all colors are white chocolate flavored) or in milk or dark chocolate too. If no colors are specified they will be made in pink, white, red, and milk chocolate. All 6 pieces are roughly 3/4 inch tall and about 2 inches wide. The set of 6 will come in one cello bag tied with a ribbon. They can also be individually wrapped in foil. Please ask for that (there is no extra charge). The shipping is for one box of 6 sayings packed in a flat rate Priority shipping box. Please convo me if you have any questions.